sites have been occupied by a succession of males for several decades. sticks on each side are decorated with lichens and pale flowers or fruits. but sometimes as low as 700m. · It is the worlds smallest bowerbird, but it is able to build the largest of all bowers. can spend at a bower, he hides fruits in different places throughout the bower. rarest or hardest to obtain. used from generation to generation, perhaps for 60 years. structure before selecting and mating. the female. Both have a golden iris. · The female, less conspicuous than the male, is olive-brown with ash-grey below. She raises the one or two young in a small cup nest in a tree crevice. until they are at least 5 years old. 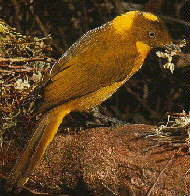 · The Golden Bowerbird eats fruit most of the time, but also beetles and cicadas. · Its voice croaks and mimics.